Are you a mushroom lover? I am! I love all kinds of mushroom and no matter what method you use to cook them they always taste good. When the Asian grocery shop near my home has fresh veggie and meat delivered I see the lovely and fresh king oyster mushrooms. 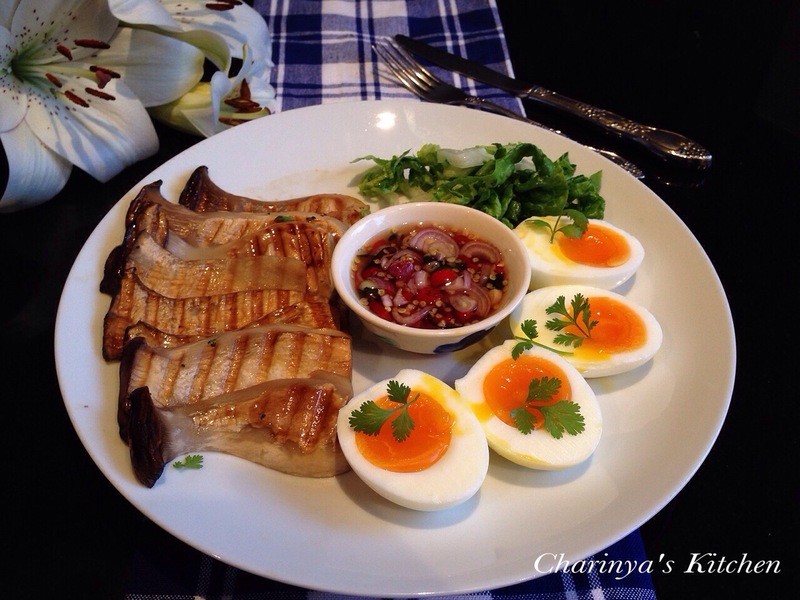 King oyster mushrooms are also known as Pleurotus Eryngii, but in Thailand we call them Eryngii mushrooms. This mushroom has a thick, white flesh that is firm-textured and meaty from the base to the cap. 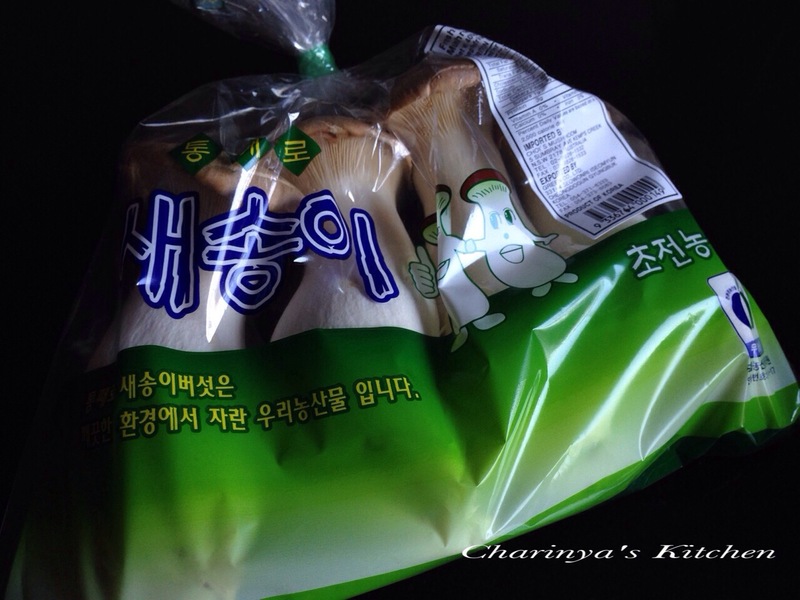 The texture is so tender and smooth, and the smell of the mushroom is great! Here is how to cook the dish. >> Combine all the ingredient to make the sauce. >> Leave the eggs at room temperature. Bring a pot of water to the boil and add half a teaspoon of salt. This will ease with peeling the egg shell. Add the egg in the boling water and gently swirl the water. The tumbling helps keep the yolk in the centre of the egg. Boil for 7 minutes. Remove the egg from the hot water and leave in cold water. When cooled, peel and set aside. >> Heat the pan and prepare mushrooms by cutting lengthwise with 3-4 parallel cuts. Gently brush with margarine. Grill until you get the light brown colour. 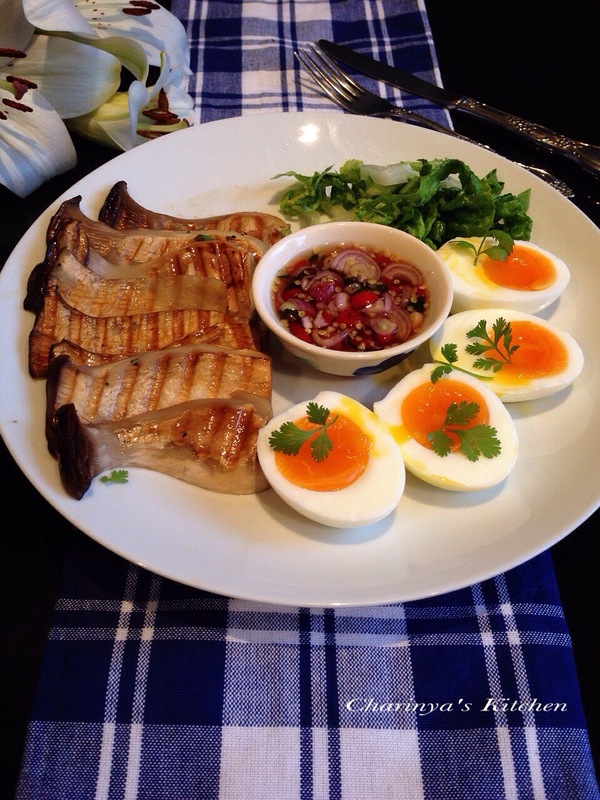 To serve, cut the boiled egg in half and arrange on the plate, with the dipping placed beside the mushroom. I often have it with rice as well, but if you want to eat low-carb just omit the rice. This is a good dish if you want a break from meat, and if you use soy sauce instead of fish sauce you will get a vegetarian meal! !